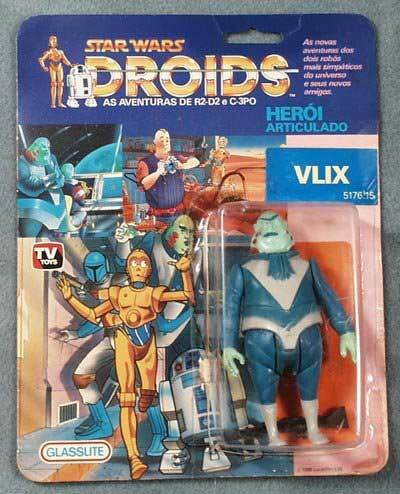 Brazilian Droids Vlix – Vlix is an obscure villain from the often maligned Star Wars cartoon, Droids. 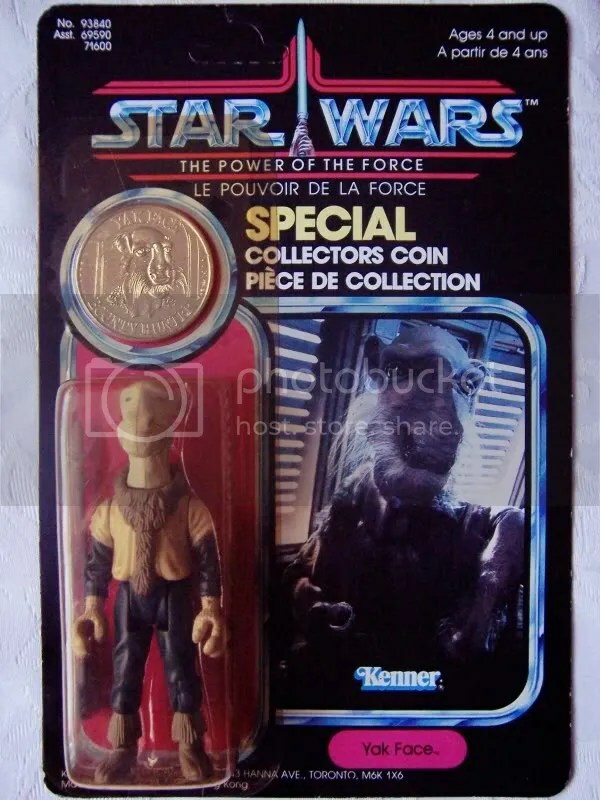 So how is it that this character no one has ever heard of is considered probably the rarest commercially released Star Wars figure ever? Well, the Droids line of figures (as well as the cartoon) did not fare too well, so it was canceled in the US after the first series of figures. However, Kenner had already developed and prototyped the second series of figures before the line was canceled (including our friend, Vlix, up there). Glasslite held the Droids figure rights in Brazil and somehow got the Vlix figure on card and in stores before everything was canceled. No other region in the world was able to release a Vlix on card. As a consequence, very few of these carded Vlix figures exist, probably around a dozen…or LESS. Yak Face – Mr Face here is highly sought after as he was at the tail end of the Kenner vintage line and never offered in the United States. He was sold in Australia, Asia and Canada, but never made it to the States. Also, he was one of the last figures offered in the Star Wars Power of the Force line (pic on the left) so he was made in limited numbers. Yak Face was also offered on a “Tri Logo” card in Europe (pic on right) in higher quantities but he came without the collector coin and no weapon. Star Wars Boba Fett – Considering Boba Fett is one of the more popular characters, it’s not surprising that one of his figures is one of the rarest and most collectible. 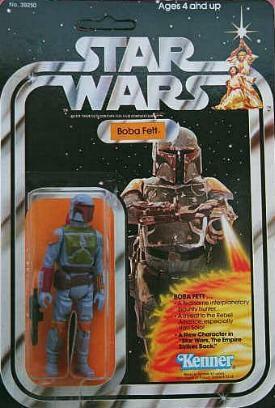 Boba, as a figure, started out as the first Star Wars mail away figure, in the now infamous “rocket firing” figure. 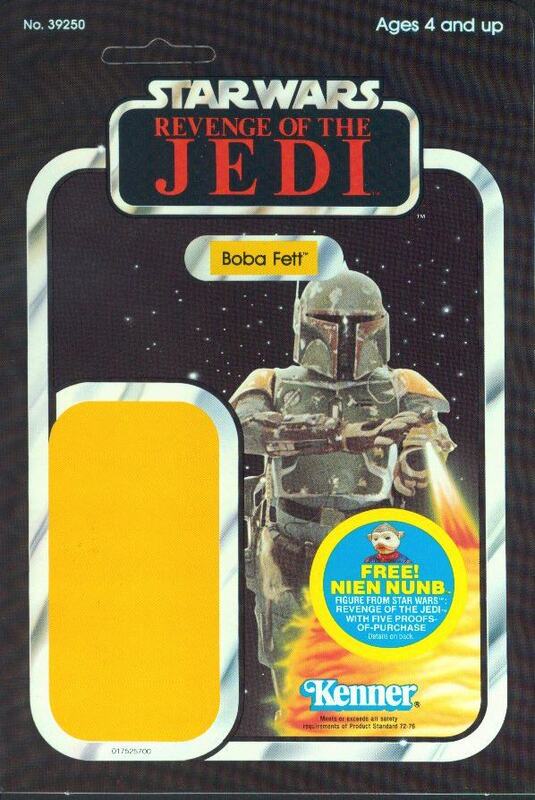 When that was done, as Kenner was gearing up for Empire Strikes Back, they decided to release Boba on a card for anyone that didn’t get the mail away figure. What’s interesting is that they released Boba on one of the last releases of the Star Wars cards. Boba wasn’t even in Star Wars and he got released on a Star Wars card. His next release would, obviously, be on an Empire Strikes Back card. So it’s easy to see how having a vintage Boba Fett carded, on the original Star Wars card (which he wasn’t even in) is highly collectible. Also, this is one of only three Star Wars figures that used original artwork instead of a still from the movie. The others were Power of the Force Anakin Skywalker and the Star Wars Walrus Man. Also, the Boba Fett released on a Tri Logo European card was cast in a lighter shade of gray, which makes it also collectible. Now, I know immediately people are going to ask why I didn’t include “rocket firing” Boba Fett. Mainly for the reason that I stated above, it was a prototype and never “officially” released as a figure. All of the vintage “rocket firing” Bobas you see are only sample mockups and not intended to be an official product. That is why I didn’t put it on the list. There are many prototypes in people’s collections now that are, for the most part, rarer than the ones I list here. Let’s take a look at a few of these. I’ve already talked about rocket firing Boba Fett, so here are three other prototypes. White Cloak Bib Fortuna Prototypes – This looks odd, but this is a packaging prototype used by Kenner to determine bubble size and how the figure would sit inside its bubble. At this point, Bib Fortuna was a new figure, so his cardback was probably not ready so they just affixed it to an older Walrus Man card. 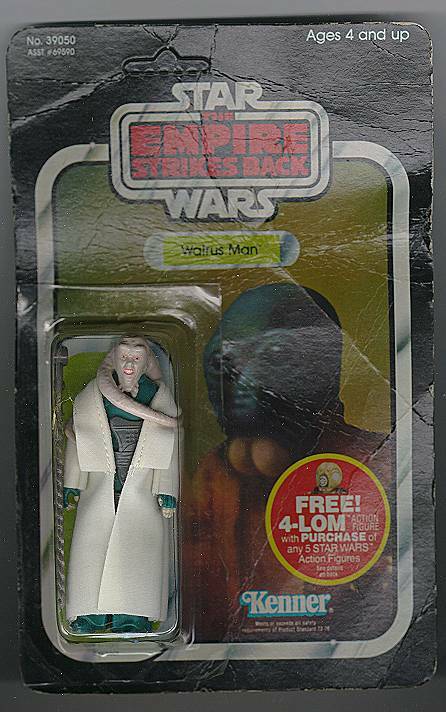 Also, the Bib Fortuna figure was not released with a white cloak. The production figure had a brown cloak, further proving this is just a prototype. There is also a picture of a Bib Fortuna in a red cloak, but these have never been proven to exist outside of Kenner product photography samples. Han Solo in Trench Coat (with no camouflage) – This is a very similar situation to Bib Fortuna. This is a packaging test to determine if the figure will fit comfortably inside the bubble. Also similar, this Han’s trench coat doesn’t have the camouflage pattern that the production figure would have. 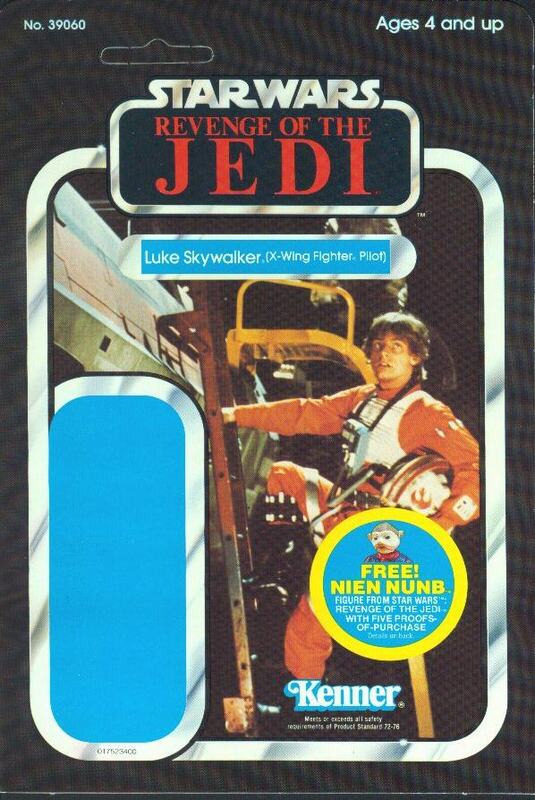 Revenge of the Jedi proof cards – This one isn’t a figure, but the card that held the figure. Return of the Jedi was originally titled Revenge of the Jedi. Many of you probably already know that, but did you know that it was a last minute change? Because it was such a late change, Kenner had already mocked up a set of 49 cards with the original Revenge title. These cards were produced as proofs and prototypes, but never released to stores. Since the name change happened very late and very abruptly, many companies had also already mocked up products with the logo. These Revenge prototypes and proofs are highly sought after in the collectibles market because they showcase what may have been. Those are some of the most widely sought after Star Wars collectibles. They can bring thousands of dollars on the secondary market. However, you have to obtain them first, and that’ll also set you back thousands of dollars. 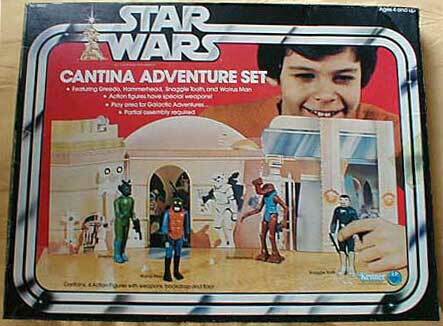 Thanks to the Star Wars Collecting Archive for all the pics and links in the article. This entry was posted on February 19, 2010 at 5:15 am and is filed under movies, pop culture, Star Wars with tags movies, pop culture, Star Wars, toys. You can follow any responses to this entry through the RSS 2.0 feed. You can skip to the end and leave a response. Pinging is currently not allowed. Did you (or do you) own any of these? my father owns a luke skywaker telecsoping, obi one telescoping, greedo with black blaster no punch out and c3po. all kenner original 12 back carded in c-10 condition. any ideas on where to sell and worth? id would be interested in them if you have a price in mind? I have all 3 double telescoping figures, where could I sell them? I’d be interested in the 3 telescoping figures. Send me an email. Ebay,or I could make you an offer!! i am a college student in need of some cash…i have a telescoping darh vader w/o saber….and a vader case full of figures….a proof card from luke skywalker in xwing suit…please some buy…im putting them on craigslist kansas city…please help i gotta pay rent….this is a killer deal for any collector. Did you sell your items? I own the original 1979 Darth Vader ceramic coffee mug mold. i still haven’t seen but one which is the one i have. Hello, I have all the Obi Wan, Luke, and Darth Vader. All Kenner first distributions but none of them still have the light saber and Darth does not have the cloak. All are in very good condition and I am curious what these are worth w/o the light sabers and cloak. Can anyone give me an idea? Actually, they did release some of the REVENGE OF THE JEDI action figures. I grew up in Philadelphia, and I found a bunch at a Rite Aid on Market Street in 1986. I was only 12 at the time but I understood the potential value. However it was a couple of years after RETURN OF THE JEDI had come out and the general interest in Star Wars had waned. Anyway, there were 8 of the figures still in the package. They were the more obscure and less popular figures. They were pretty scuffed up after languishing on the shelf for, literally, years. The plastic bubble was crushed on 3 of them, but still glued to the cardboard. They were on clearance and I got the lot for under $10. I held on to them for years. After I dropped out of college in 1994 I ended up selling all of them plus 3 of my large Kenner Star Wars figures and 4 GI Joe Zartan figures ( also still in the box) for a whopping $75. I regret a lot of things in my life, but this one truly haunts me. I do not. Blue Snaggletooth is probably the easiest one on this list to get, but I never got him. I agree with you actually, I believe! Will that possibly be workable so that you can get your webblog translated directly into Spanish? English is actually my second language. Extremely nice article. Really hit on some of outstanding ideas. Thanks for putting that together. Adding this blog in my RSS feed! hi ive got a boba fett figure rocket firing year 1979 by kenner. So is this rare then? Half of me wants to make fun of all of you for your interest in star wars figures, and the other half wants to buy the complete collection. I had a halfway decent collection between 1977 and 1980, but always wanted more. Where are they now? How many things do you wish you never got rid of as a child? I have a Lobot in its package 1981 Empire Strikes back and he has two Left Arms…..What is that worth?? Not sure on the value but i would be interested in buying it? Would you be willing to sell a few? I need about 4 POTF figures to complete a future collection for my son. Drop me an email. Lol, I have 2 of the telescoping Darth vaders. One with cape and plastic saber, one without cape and saber. Just found them in my grandma’s stuff, along with a C3po and a yoda 🙂 I remember playing with them when I was little! If this is true would you be interested in selling them? I collected the figures from the first 3 movies complete…over a hundred pristine on cards…anybody have a clue as to value…??? depends what they are? but i would be interested in buying them/some? Can I just say what a relief to discover somebody who truly knows what theyre talking about on the internet. You actually know how to bring an difficulty to light and make it important. A lot more persons need to read this and understand this side from the story. I cant believe youre not a lot more well-known because you definitely have the gift. when did this page come out? In my opinion this are very good hints and thank you for giving your opinion… also nice blog! Congratulations…. If you actually have what you say you have, then you are sitting on a gold mine depending on the condition of the cards/boxes. 12 carded 12 back Star Wars figures could conceivably fetch upwards of $4000. About $300 each. Probably more, but the market is low right now. i have the 1978 darth vader , luke skywalker , obi wan , jawa , and the boba fett. I have 3 Star Wars Next Generation figures, unopened and still has wal-mart price tag on them. 1 is Ambassador Spock, 1 is Lieutenant Worf, and 1 is Borg. Though they are not mint, they are in great condition. I would like to know there worth and if anyone is interested in buying them. Will be glad to send pix. I have a picked up what I think is a very rare star wars action figure in a charity shop yesterday. It marking is not Kenner. It is L.F.L 1981 which I presume is Lucas Films Ltd. I’ve never been able to get hold of this one before. And did have an avid collection before a house fire welded the Rancor monsters are on the the top of the millenium falcon and dwarfed each of my 130 figures by 10%. if there worth anything ? Sounds like some cool stuff! Send all your information to my email address and lets see if we can get some deals done. It affects the value a bit,but if they are hasbro they are not worth much,those came out in the 90’s after Kenner was bought by hasbro,now if they are kenner then you got something!!! I DONT KNOW MUCH ABOUT THESE TOY I DID A LITTLE RESEARCH AND I HAVE A POWER OF THE FORCE THE ONE (POTF2) IT LOOKS LIKE A MISS PRINT OR A MISTAKE IT IS PRINE XIZOR ON A LUKE SKYWALKER CARD WHAT NOT IN MINT I COULD SEND PHOTOS. I WAS GOING TO PUT HIM ON EBAY BUT I DONT SEE ANYTHING LIKE THIS AND AM SCARED ON LOSING OUT BECAUSE OF IGNORANCE MAYBE YOU KNOW SOMETHING ABOUT IT?? Great article! I have the darth vader with telescopic sabre (no cloak) any idea what it’s worth? I just came upon a huge Vintage Star Wars collection that I am looking to sell. 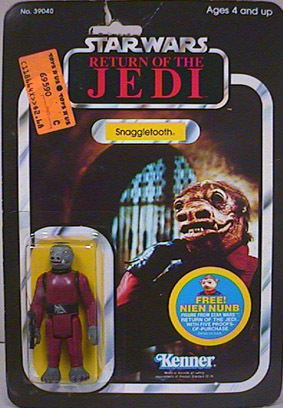 Included is the following: Tons of Mailaway figures still in Kenner Plastic Including the Blue Snaggletooth. dagobah x’s2, jabba the hut, battle damaged x wing fighter , rebel transport, darth vaders star destroyer X’s2, plus more. All this stuff is factory sealed. If you are interseted then shoot me an email. I have a r2d2 with trading card in an unopened package, but labeled as c3po. Value? I have a “20 back” Obi Wan double telescoping figure that I just found in storage. New in package. Unopened. The back features the mail away offer for Boba Fett (expiration date on the offer 5/31/79). The card is in excellent condition, but the blister has a crease on it. Possibly interested in selling. Contact me: alderd [at] gmail.com. Are you sure its double telescoping? Hello, I have a wealth of original Star Wars figures and vehicles. X-wing (boxed), Darth Vader tye-fighter (boxed), 3 Scout Walkers (one boxed), scout bikes, Boba fets space ship (boxed). Are these valuable, any interest out there……. Which box is the x-wing fighter? Reg. Star wars package,tesb,or rotj? I have two 1978 Darth Vader jackets for kids that i’ve have from back then. I looking to sell then I well upload picture some time this week. Anybody interested please contact me. I have recently come across a Revenge of the Jedi Proof Card Luke Hoth, and a Power of the Force proof card of a figure that was not actually produced on the card back – Imperial Commander, (also have the coin, but i believe that it was available via mail order. I’m not having much coming across a current value for these things. I know that years ago they were worth several hundred dollars.. I am curious of their value and willing to sell them for a fair price if anyone is interested. I have a lot of other collectables that i have yet to even catalog, my father once owned a company called Starpieces and he is no longer capable of managing it. Does anyone have info on a box set that i think came out before the original Star Wars movie. There were 4 figures included. It was mailed in a white box with no markings. They are smaller in size than the standard figure sized. Think it included Luke Skywalker, chewbacca, Leia, but will have to check again. My wife got it way back when and we’ve had it in our closet. It sounds like your wife has an “early bird edition” mail away kit. If it is complete and the figures are in good condition, it definitely has some value. If the Luke figure has the double telescoping Lightsabre (which means the thick plastic extends AND the thin plastic extends further), it is worth significantly more. Feel free to email me if you have additional questions. I don’t know much about Star wars figures, but my son collected them. i ran across most of his collection and he has several of the “rare’ ones–but i’m not sure which guns go to which figure etc, all his stuff is in a box! Anyway, he has bobafet, and the tiny little figure in the vinyl cape the jawa, also telescoping luke and obi-but the holes are in their hands, no light sabers–probably they are around here somewhere…anyway, looking to price these or get rid of them to interested parties. he has quite a few figures, none mint, all played with. I have the blue snaggletooth,yakface, and I’m working on getting a hollow cheek sandperson(tuskan raider)which is not mentioned,but I recently acquired two tie interceptors that the owner is claiming are prototypes of the toys,they are 6″ at its widest,but are done up exactly like the toys in 3 3/4″,if anybody has info on these I would appreciate it,or where to look to see if I can verify. Thanks!!! Can anyone give me an estimated value on good condition, loose, double telescoping Vader and Obi? Boba Fett is in the original Star Wars, but the scene was cut when George Lucas cut the scene with Jabba played by a human actor. Vintage star wars figures for sale. Looking for mostly boxed or carded if you have any? I have in stock, one -Revenge of the Jedi, proof cards #69620 At-At Commander with unpunched hole. Need to know if anyone can help with the value of this item. The 48 back revenge of the jedi proof cards are common, plus the At-At CDR isn’t that desired of a figure like the main characters. If this is the standard proof and in MINT condition you are looking at about $250-$300 USD. There are 5 different proof card versions. shoot me an email if you have more questions. Hey everyone. I have come across an obi wan telescoping light saber figure and I’m eager to find out what it’s worth. Any help would be appreciated. Thanks. just found out about 8 bucs. I thought is was worth a lot more. Hi Bill i would be interested in buying it if its for sale? For the right price i probably would sell it. How much would you pay for it. Refresh my memory did i include a picture??? Would you like to see a picture? Can someone please tell me how long Luke Skywalkers telescopic lightsabre should be when fully extended please? Have one and just want to check it’s as it should be! Thanks! I have a Revenge of the Sith Anakin Skywalker figure with a correctly printed card, and the exact item with “Darth Vader” printed in the name space on the card. It was obviously a misprint but I can’t find any info on pricing for this item. (Both are unopened.) Any hints for me anyone? I have a decent condition Boba Fett, with the blaster! I have Yak Face (unsealed) with weapon. Also Darth Vader en Obi-Wan. Only the extended sabre of Darth Vader, has broken. I have a little piece of the broken part. And the extended sabre of Obi-Wan has not the full lenght any more. There is still a small piece on the extended sabre. Is someone interested in this? I live in the Netherlands. What do you want for the yak face? I have a telescoping obi-wan for sale. Anybody interested in buying it? It is out of package but in great condition. Please email at corylewis22@msn.com with offer. Thanks and hope to hear from you guys soon. Question I would have a blue snaggletooth minth. Could anyone give an estimate for how much they would go for nowadays? Pleas email dave_erica@hotmail.com thanks! 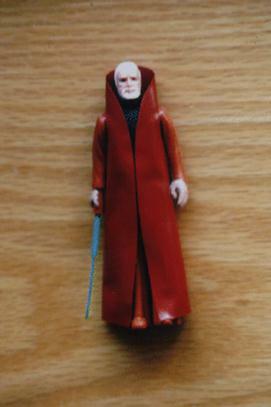 and also the Double Telescoping Obi-Wan but unfortunately without the box (water damage) anyone interested? We have a vintage vinyl cape jawa but it is an Australian released one, so the cape is slightly redder than the American released ones. Its genuine, as my fella has owned it since he was a boy, so no dodgy cutting of Obi-Wan Kenobi cape with this fella! It’s not carded but still in great condition…I’ve written bloody assignments on this figure for Uni for Museum Collection Management! haha love it!!! We have some figures including the 1978 Obi Wan and Darth Vader DT (at least it appears to be…I am no expert on this stuff!). Also the blue Snaggletooth, among others. Would consider selling. I just found this article. When clearing out old toys from my parents house I have found two Australian vinyl caped jawas. No card, not sure about the guns and played with when I was a kid but excellent condition. Anyone interested? i bought a brand new Yak Face in the 80s / 90s when i was a teen, in England. No weapon. You guys forgot the Hasbro (I think it’s Hasbro I could be wrong) Darth Vader where they gave Vader a green lightsaber instead of a red one by accident. It’s worth MILLIONS. I have the blue snaggletooth and all three double telescoping lightsaber figures. Obi Wan and Luke Skywalker r missing sabers, but darth vader is all there and intact. All figures r loose also. Any one interested? I am willing to sell for right price. My boyfriend has about 33 vintage characters. All from first 3 series. They are loose however but were well kept. They all have their weapons (except 2),capes cloaks etc. Also the single telescoping Darth Vader, the light green Yoda with brown snake, Ugnaught with purple apron, and Obi with gray hair. Hi! I have 93 vintage STAR WARS-Figuresfor SALE! The are all from Kenner, Original First Edition, bought between 1978 and 1983. 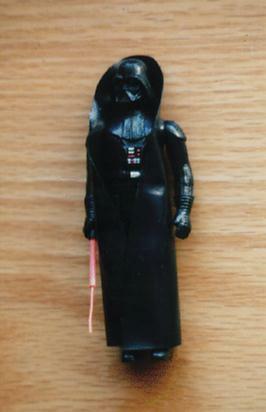 I have a 1977 Kenner Darth Vader with 2 part light saber and cape with original bag. No country of origin on the leg. I would like to find out how much this is worth. Can anyone help with this? followers! Exceptional blog and superb design. 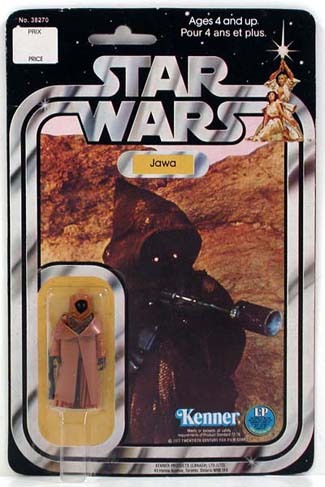 Hi I have the jawa that’s shown on the left hand side of the article in full vinyl cloak in mint condition and mint condition box. I have luke Skywalker and darth Vader telescopeing figures but the light sabers are missing they are in good condition and i was wondering what the value on the figures would be thank you looking forward to a reply. is vader in his original packaging? I would think the same but these are the only ones I’ve ever had. Any way to prove the saber came with Vader? hello! i used to own a new Yack Face with no weapon, back in the 80s/90s. I was chuffed with him. I never knew he was so rare. i had a big collection which i sold in 1999/so. And i once saw a blue Snaggletooth for sale in a small shop in Brighton, wher i lived! I never saw that befor and i didnt know what to make of it, and he was very expensive! I live in England. 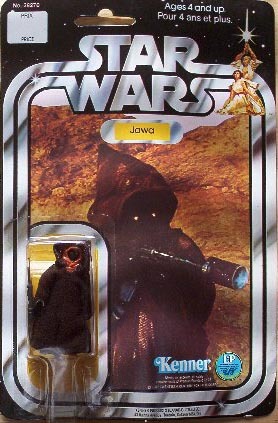 Also, in the late 80s, a school friend gave me his 3 jawas and one of them was vinyl-caped. Thanks for explaining what the blue Snaggletooth is about – both Snaggletooths were always a mistery to me untill today! I have a loose obi wan with telescoping light saber. Anyone interested? I might also have the jawa with no weapon but vinyl jacket. I say might cause I’m not sure if its real or a fake. I will get you something tomorrow. Thanks for the reply. Hi have a question to ask if anyone knows the answer please email me. I have a un-opended still carded ( made by kenner, i think ) star wars shadow of the empire stormtrooper ( photograph on the front ) with the words stormtrooper with blaster rifle and heavy infantry cannon, however it is in fact hans solo in the packet. still carded but has creasing to it. Any ideas if there are any more out there or where i can find out what it is worth. I have a Yak Face at home! Hi please check out my ebay auction, I have no idea what i have and may have set the reserve to low. thanks here is the title of auction. i have the following : mint c9.5 yak face on card, VC jawa on card and SW, ESB, Jedi, Droids and trilogo fetts on card. I have a 1977 Lobot in its package no. 39349 asst. number 39300 and it has two left arms. I called it in and they have no record of this error as of yet. I am wondering if I sell it what should I let it go for? I am selling my entire Star Wars collection if you’re interested. The best way to contact me would be to leave a reply here on this site or call me. I’ve been having some major issues with my email and gmail accounts. I apologize for the inconvenience. If you would like a complete list of the items in my collection, I can either post them here or mail it to you the old fashioned way. 6017947410 anytime Monday through Sunday. Will you please send me your list and prices please? 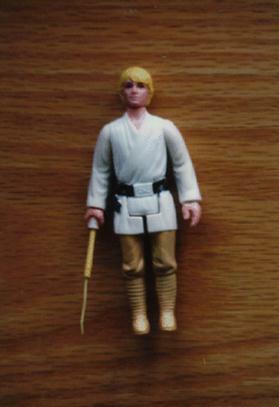 Hi, I have a extremely rare and unique Luke skywalker return of the jedi figure, is new and in its original package, its the figure in the “Throne duel room” in which luke is killing Darth Vader, but the weird and unique thing is that Luke has the black glove in the wrong hand, (left hand) all the ilustrations around the package are obviously correct, but the figure has the black glove in the wrong hand. It is unique and I was told is a very collectible ítem, I want to sell it, please respond if some interested and I will send picture. is the packaging without the figures worth anything as collectables. I have some Kenner packaging of all figures? Hello to every body, it’s my first visit of this webpage; this web site carries amazing and in fact excellent material in favor of readers. I have some of the rare figurines but they are not carded? Are they worth anything really? I have the vinyl caped Jawa, Luke, Darth Vader, and Obi Wan retractable light sabers. all uncarded…but part of a collectors set and case which is in pretty rough shape. I am just wondering what the value is in your guys opinions?….as I simply don’t have a clue. Thanks. I really like what you have bought right here, certainly like what you are stating and the best way during which you say it. I have a 1979 Boba Fett with a sealed rocket, can someone please give me some advise. i also have a 1977 Princess Leia and some other goodies. Decided to put everything in a Lot, please have a look and gl. Sorry to burst your bubble about the “rocket firing “Boba Fett”. But, there were working toys built, using production tooling and the production manufacturing process. These were limited to about 80 to 100 pieces and were shipped from HK to the Product Integrity Department at Kenner in Cincinnati Ohio. They were produced for the specific purpose of being used to qualify the product for production by means of the product reliability testing and product safety testing. I say this because I was the reliability technician who was responsible for the testing and evaluation of the product. The items were sent directly to me. There was one shipment and one shipment only of the rocket firing figures which arrived in a box about the size of a shoe box. The items were individually packaged in plastic bags, None were ever produced on a blister card. I performed the testing required, which resulted in the destruction of all of the units with exception of around 20 pieces which were unharmed. I personally kept the 20 which were still in good working condition and over the first year or two I gave them away to the children of my friends as gifts or birthday presents and such. About a year ago, one my old friends looked me up and reminded me that I gave 2 of the figures with the working rocket launcher to his son—- and they still have them. Over the years I have tried, on occasion to find out who else I gave these items to, but have struck out. To the best of my knowledge there are 2 authentic production units in existence. The others are either trashed or buried in someone’s basement or attic. The above narrative about there only being mock-ups or prototypes is totally false. The Items I have described are true production units made from production tooling in a production enviorment. Contrary to your current beliefs, there was one and only one preproduction runs of the rocket firing Boba Fett which was made specifically to be sent and used in the Kenner Product integrity department for product safety and reliability testing. These were NOT prototype, mock-ups or any other such items. Thet were produced from production tooling on genuine production lines and painted and decorated by production people and production processes. There were about 80 to 100 pieces produced and shipped Cincinnati to my attention. I did the testing and wrote the reports. About 20 units survived the testing protocol and I personally retained them and gave them out to friends and family over the next year or two—– so there are a few real production figures somewhere in the world. I know the location of 2 of them. Chances are the balance have long ago hit the dustbin of time. I’ve just been browsing this site for info on star wars figures. Like many mums in the 80’s I bought my son many star wars related items. I still have a card and figure of Boba Fett from about 1984. The card no. is 39250 ‘The Empire Strikes Back’ with a logo of Free! Revenge Of The Jedi’. On the back of the card are pictures of a fair amount of star war figures. The special offer is for a free Admiral Ackbar. The blister cover is long gone! There was another one but it went ‘missing’. I still have one of my son’s old membership card for ‘Bantha Tracks’ club and an old ‘cinema’ poster? which I obtained for him from a toy shop near our local cinema and was closing down. Poster is The Empire Strikes Back. There are tack holes on it as was stuck on his bedroom wall. hi Phillip, i just wanted to share a story with you. a sad story actually. when i was a young kid right before Return of the Jedi came out, my mom apparently recieved a phone call from the store manager that my parents knew, of our local Kmart. i guess he told her that there were “Revenge” of the Jedi figures in the store. she packed us up, or atleast me (i don’t remember my bro and sis being there), and we went to the store and my mom filled the shopping cart up with all of the figures from the endcap. every single one. i assume the store was told to send the items back to the manufacturer or what ever, but he called her since they were all friends, and knew that my parents were heavily into collectables i guess. so she had the figures now, and explained why to me. well, as i now know the figures ended up in our attic for some reason. here’s the sad part. some time after that, while i was away in the army, they had the roof re-done. i guess they had to replace some of the plywood, because later in the year my mom went up to get Christmas decorations, and the attic was cleared out! they stole everything. as i’m told, my mom came down in tears. all of our stuff was gone, my old blanky and all. i was, and am also very upset MY Micronauts from when i was very young being gone. they were taken away from me after my baby sis started putting the Micronaut figures’ feet up her nose. i think i was mentally damaged by that, because i started collecting the things again as an adult, and practically foam at the mouth when i look at the ones i don’t have online. anyway, the thieves got away. my parents felt weird about accusing somebody’s employees of stealing 6+ months later. plus they had no proof really. anyway, that’s my story. i didn’t realize how valuable and rare those things actually were until the newer Star Wars movies started coming out. some sites i’ve visited were actually saying that the figures were a myth, and never really existed. i know that to be false, because i saw the things with my own eyes. Have read your comments and I commiserate with you. When things like this happen we can keep our dignity, even though it’s maddening!! I take comfort from the fact that there may be someone out there who may be horrified to learn that they have received ‘suspect goods’. I have the first shot prototype of Obi Wan Kenobi with 2 sabers. Any idea of the value? It is very rare as most are with 1 saber and this action figure is with 2 sabers + AFA serial 10697738. I have a Luke, Obi and a Vader, all with the retractable light sabers and Obi and Vader have full vinyl capes! When I was a kid, I thought the small part of the saber sticking out looked bad, so I cut that part off of them so that you couldn’t see the saber, until you extended it out! They are loose, but in good shape other than the small part of the sabers cut off! Are they still worth much and how much possibly? I also have a 15″ Chewbacca, but his arms have came apart where the rubber band held them to his body, but could be replaced. He has the belt and gun, what might he be worth? I have chewbacca, c3po, r5-d4, darth vader, and chief chirpa the ewok . All unwrapped in great condition, is anybody interested. Hey, I´m from Brazil and got an original Vlix, looking to sell it… Is there an email where I can send you the pictures? Hit me up here with pictures. I have a bag of original Star Wars cards found the box after 20+ years. Should I get an opinion on them? I have a black series luke skywalker in a unopened (i think) box with a #22 yoda box, is this a hoax ? I have a assortment of Star Wars figures from the 70s and a 21 card Boba Fett in the package. I have the 1995 Kenner Power Of The Force II Boba Fett. Can anyone tell me why it is so hard to find a 1981 empire Strikes Back Boba Fett with a 45 card back ? Trying to find the value. Condition is everything when estimating value. 45 boba in C8 condition should be around $2k.